The surface ocean is rich with life, all of it ultimately driven by phytoplankton. These microscopic plants use light and nutrients to fix carbon dioxide from the atmosphere, blooming each year as spring starts. Their growth feeds marine animals of all sizes, and drives our vital fisheries. Understanding how climate change will impact this is a key research goal of ecosystem modelling at the NOC. 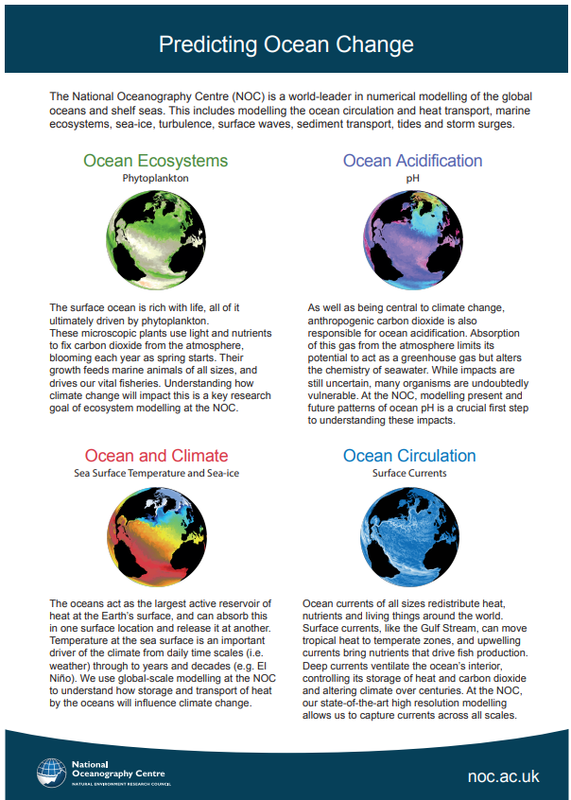 As well as being central to climate change, anthropogenic carbon dioxide is also responsible for ocean acidification. Absorption of this gas from the atmosphere limits its potential to act as a greenhouse gas but alters the chemistry of seawater. While impacts are still uncertain, many organisms are undoubtedly vulnerable. At the NOC, modelling present and future patterns of ocean pH is a crucial first step to understanding these impacts. The oceans act as the largest active reservoir of heat at the Earth’s surface, and can absorb this in one surface location and release it at another. Temperature at the sea surface is an important driver of the climate from daily time scales (i.e. weather) through to years and decades (e.g. El Niño). We use global-scale modelling at the NOC to understand how storage and transport of heat by the oceans will influence climate change. Ocean currents of all sizes redistribute heat, nutrients and living things around the world. Surface currents, like the Gulf Stream, can move tropical heat to temperate zones, and upwelling currents bring nutrients that drive fish production. Deep currents ventilate the ocean’s interior, controlling its storage of heat and carbon dioxide and altering climate over centuries. At the NOC, our state-of-the-art high resolution modelling allows us to capture currents across all scales.